Alexandria Ocasio-Cortez is running for Congress to create an America that works for all of us, not just a wealthy few. As the markets crashed in 2008, Alexandria's father passed away from cancer. He was only 48 years old. Her family was suddenly thrown into crisis—having lost its primary source of income in the middle of a recession. As the financial reality caught up to her family, Alexandria found herself working two jobs and 18-hour shifts in restaurants to help her family keep their home. That experience put Alexandria on the other side of laws and policy, as she went from reviewing economic outcomes to having first-hand experiences with families struggling to maintain decent housing, healthcare, and immigration status. That dual experience has given her a much deeper understanding of how policies impact our families beyond the white papers. It’s one thing to write healthcare policy—it’s an entirely other matter to have to deal with healthcare, housing, and education systems ourselves. That advocacy has called Alexandria to engage with families across the country—from the South Bronx to Flint, Michigan and Standing Rock. NY-14 is one of the most progressive districts in America, but you wouldn’t think it from our current representation, which routinely works to deregulate Wall Street banks, and rules in favor of the luxury developers pricing out our families. Our current incumbent doesn't even live in New York, and resides full-time in Virginia. Alexandria decided that the Bronx and Queens could do better. We can champion improved and expanded Medicare-for-All, a Federal Jobs Guarantee, tuition-free college and criminal justice reform. If any community that can elect a representative to lead on these issues, it’s NY-14. When Alexandria first started this campaign, she knew that in order for us to change our Congress, we had to change how business is done in New York. She had to run a campaign with integrity and turn away from lobbyists. NY-14 has one of the lower voter turnouts in the nation - but that isn’t because voters are uneducated; it’s because after generations of backroom dealing, we haven’t felt that our vote truly mattered. Ocasio2018 is changing that. We began this whole campaign with the mission of bringing together a broad coalition of groups and communities to listen to their needs and give everyone an open and transparent seat at the table, where all are truly welcome to share their perspectives and organize power. It’s the only ethical way to run in NY-14, one of the most diverse communities in the United States. Here we are homeowners and renters; we live in dense urban areas and peninsular communities. We speak over 100 languages, encompass many different religions, and have two different baseball teams, each with their own rabid fan bases. If it’s any community that can show America how to get along and champion working class values, it’s us. The proof is in our results. Alexandria’s historic candidacy has already made history. In April, hundreds of Ocasio2018 supporters came together in a 100% volunteer led, no-corporate money effort to collect thousands of signatures. In doing so, they triggered the first NY-14 primary in almost a generation. 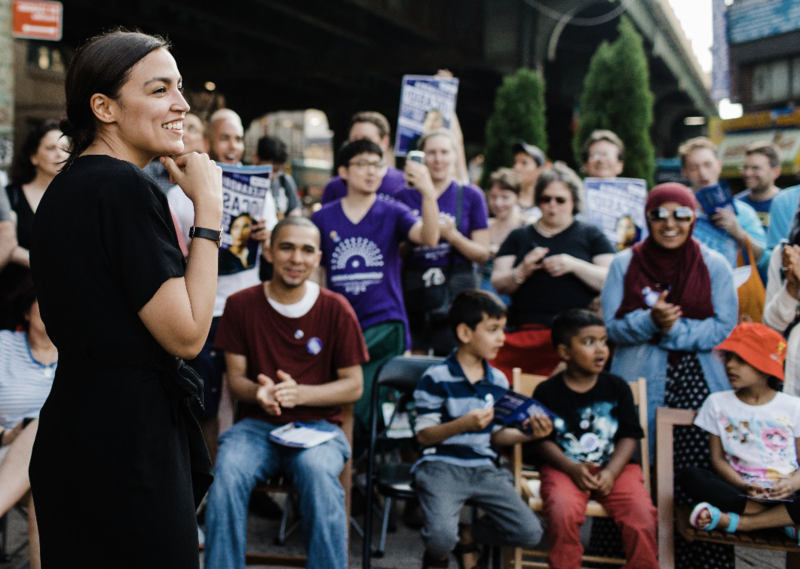 Ocasio2018 has created a cascade of firsts: Alexandria the first NY-14 Democratic challenger in a generation; the first NY-14 candidate to run without any lobbyist money in modern history; and the first woman of color to *ever* run in NY-14 (a district that’s 70% people of color). This is just a taste of what we can accomplish when everyday people come together.